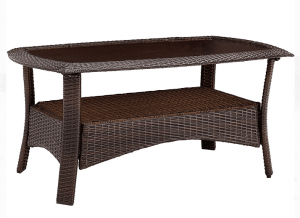 When looking at resin wicker outdoor furniture sets, your choices and the prices will vary from collection to collection. The Strathmere collection will give you a lot of choices when looking at a conversation set for your outdoor seating needs. You will need a large space for these sets, at least a 12-foot by 12 foot area to not feel crowded. 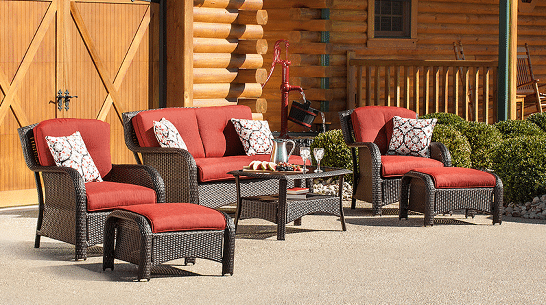 From a simple four piece patio conversation set to a six piece set with ottomans and a gas fire pit, this collection will give you a lot of choices to fill your seating needs. Steel frames with a powder coated finish will be covered with a woven resin wicker cover. This will give you a rich looking finish with a more expensive look. Five color choices for the cushions will give you even more choices in your patio furniture. To look and see if your choice in color and design is available today use the following link. 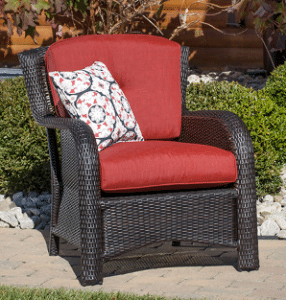 There are five color options available in cushions for this resin wicker outdoor furniture sets in the Strathmere collection. They are Navy Blue, Cilantro Green, Woodland rust, Crimson Red, and Ocean Blue. Each color of cushions will have matching throw pillows that will color code to give you a nice outdoor decor. A throw pillow will be included for each seating position. Not all color combinations are available in all furniture choices. For current options please use one of the links to Walmart.com to find current availability and pricing. The standard patio conversation set will include a love seat, two straight leg chairs and a tempered glass top coffee table. This can be changed by choosing different options. The chairs can be changed to a swivel chair for some motion in your outdoor seating. The straight leg chairs are 30.75 inches wide, 34 inches deep and 35.5 inches tall. The seat is 20 inches wide, 24.5 inches deep and 17.5 inches from the floor with cushions installed. Each chair will support 250 pounds. Chairs are available in a swivel option for those who want extra movement in their seating. Chairs are almost the same size at 30.5 inches wide, 34 inches deep and 35.5 inches tall. The swivel option will take away 25 pounds of capacity for this chair, down to 225 pounds. Love seat will be 63.75 inches wide on the outside, with the seat being 52.5 inches wide for seating. Weight capacity for the love seat is 450 pounds for the two seats. Cushions will be supported by a woven resin wicker panel that cannot be used for sitting without seating discomfort. Thick cushions with Olefin fabric and foam support will give great comfort in long term sitting. No zippers are found on these covers for removal for cleaning. Do not forget to store your cushions when not needed to prolong their outdoor life, see some of my storage solution choices here. Coffee table will have a removable tempered glass top. Four curved legs will have a woven resin wicker shelf for support that will offer some storage for books or snacks. This is a standard sized coffee table at 41.25 inches long, 25.25 inches wide and 19 inches tall. Table will support around 125 pounds of weight, my want to keep kiddos from sitting on it though. Some sets will have a gas fire pit to take the place of the coffee table. The fire pit will have a steel cover for the burn pit so that if you need a table during warm weather you do not have to change out tables. Two different styles of the same fire pits are available. 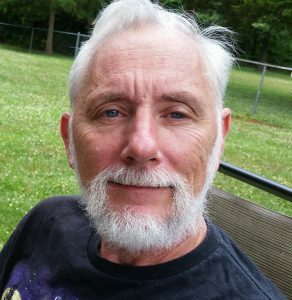 The only real difference is the color of the style used for the top. The porcelain tiles are available in a wood grain or slate tile finish. They can be replace if broken, you may have to cut and replace all six to match a color. The gas fire pit will put out 40,000 BTU's of heat. This will heat an area of about 15 foot diameter on most cool nights. 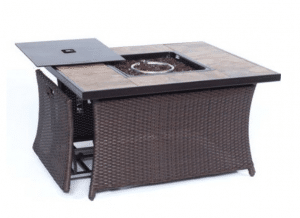 You can use a gas fire pit on most deck surfaces, you cannot do that with a wood burner without proper heat protection for the surface on wooden or composite decks. Fire pit will have a slide out drawer for the 20 pound propane tank (not included with purchase). This makes for easy swapping out the tank when needed. Controls and igniter is behind the drawer also, this is a child safety feature that I like. When you need extra seating or just want a leg rest for after a long day at work, get the set with included ottomans. They will come with matching cushions. Ottomans are 21.5 inches wide, 28.5 inches deep and 16.75 inches off the floor, matching the other seating pieces. Each ottoman will support 150 pounds, a small adult or a child. Try to keep you big family and friends from sitting on these to make them last. 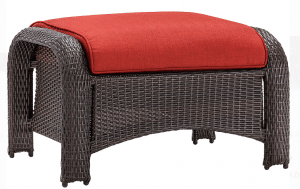 Each ottoman will have resin wicker sides and legs, the cushion will have a resin wicker shelf to support the cushion. It is not recommended sitting on this material as it will lead to sagging of the resin wicker and be uncomfortable on your back side. A recliner chair is an additional option for this collection. It is not included in any set, you can add to any set from this collection or just purchase as a stand along piece. The recliner is 30.25 inches wide, 36.25 inches deep and 40.75 inches tall. It is taller that other seating pieces in this collection. The seat will be 17 inches from the floor and it will support 250 pounds of weight. Three positions on the recliner will be moved by your body weight. Some will find relining easy, some will have trouble with adjusting their body weight to get the chair to move. Full reclining position is about 3/4 of the way to flat. This chair will work great for those looking for inside type of comfort in their outdoor patio furniture. 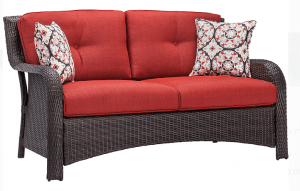 Wow look at all of these choices of cushion colors and different styles of pieces available in this resin wicker outdoor furniture collection. 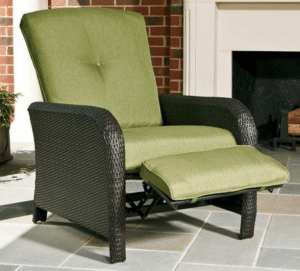 The Hanover Strathmere resin wicker outdoor furniture sets will fill the needs of many people looking for resin wicker patio furniture on a budget or are looking to match their outdoor seating needs. This collection will have a variety of finishes and styles of seating and tables. Most will find a set that will match their needs. I find that this set will be very comfortable and if you chose the gas fire pit, you can use this set for most of the year. Having a great heat source will allow you to entertain even on those cool nights when all of your neighbors are watching the TV on the couch. 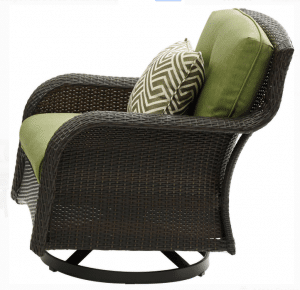 If you need to look at other options of patio furniture with woven resin wicker finish, please look at my view on the Hanover collection in my post here for more choices of styles and color. Have a comment or a question on this collection, use the forms below and I will get back to you shortly.